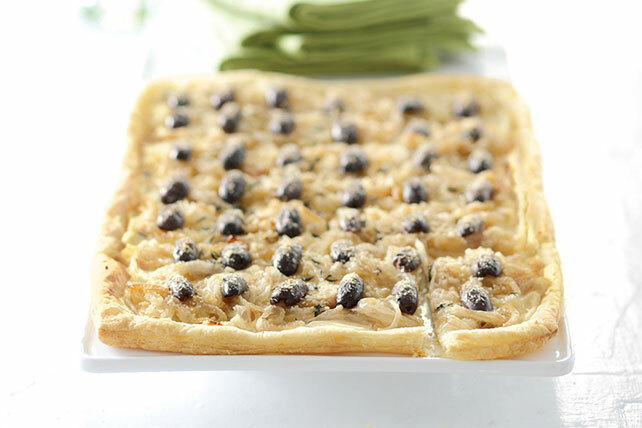 Have the recipe for this Caramelized Onion Tart ready when you bring it to potlucks. People will want to make their own Caramelized Onion Tart! Cook onions in oil in large skillet on medium heat 15 min. or until golden brown, stirring frequently. Add garlic, thyme and salt; cook and stir 2 min. Heat oven to 400°F. Unroll pizza dough onto baking sheet, stirring frequently; press into 14x12-inch rectangle. Bake 5 min. ; sprinkle with half the cheese. Top with onions, olives and remaining cheese. Bake 10 to 12 min. or until edges of crust are golden brown. Onion mixture can be made in advance. Cool completely, then refrigerate up to 24 hours before using as directed. Substitute 1 pkg. (1 lb.) frozen pizza or bread dough, thawed, for the pizza crust. (Do not prebake dough.) Press dough into rectangle on baking sheet as directed; top with cheese, onions and olives. Bake in 425°F oven 25 min. or until edges of crust are golden brown. Makes 8 servings.